There will be much talk in the coming year about the centennial of the Panama Pacific International Exposition of 1915. This world’s fair was a spectacular and significant event for San Francisco, less than a decade after much of the city was destroyed in the 1906 earthquake and fire. Ina Coolbrith, who was now in her seventies, had been a highly regarded but impecunious Bay Area poet and an honorary member of the Bohemian Club since the 1870s. In 1892 she had been dismissed after nineteen years as librarian for the Oakland public library, where she had been paid meagerly but was fondly remembered for mentoring Jack London and Isadora Duncan, among others. In 1893 she had been commissioned to write a poem for a California event at the World’s Columbian Exposition in Chicago. But it seems the Panama Pacific Exposition Board did not come up with funds for a commissioned ode, so Sterling went ahead and wrote and submitted to the San Francisco Examiner “over 250 lines. I hope to Gawd they accept it! It’s rather Socialistic: but Hearst shouldn’t be particular along lines!”3 The Examiner paid him $125 and published the poem on the exposition’s opening day, February 20, 1915. Before that, Sterling was surviving in New York largely through the charity of Albert and other friends. 1 George Newhall to Charles Moore, 11 October 1913, PPIE Archives, Bancroft library, UC Berkeley, box 66, folder 41. 2 George Sterling to Bender, 24 November 1914, BP. This letter was published in facsimile in 1935 (years after Sterling’s death) by the Book Club of California with an introduction by Robinson Jeffers about Sterling’s generosity: “The Letters of Western Authors–Number One,” 1935, sponsored by Albert. 3 Sterling to Bender, 1 February 1915. 4 Sterling to Bender, 17 December 1914. 5 San Francisco Chronicle, 1 July 1915, p. 7. 6 The text of the Ode is available at http://www.books-about-california.com/Pages/Ode_On_the_Exposition/Ode_On_the_Exposition_text.html. The artist with whom Bender was perhaps closest after Anne Bremer was Ansel Adams, who decided to be a professional photographer rather than a concert pianist through Bender’s encouragement. Immediately after they met in 1926 Bender invited Adams to his office, looked through his photographs of the High Sierra, and declared, “We have to do a portfolio of these.” He made all the arrangements for an edition of 100 portfolios, printed by Grabhorn, with 18 images each, to be sold for $50 each. Bender said he would take ten copies and handed Adams a check for $500, then got on the phone and lined up additional supporters until half of the edition was pre-sold. Bender was 60 when they met and Adams was 24. Bender was just over five feet and Adams was just under six feet. But they became great friends and jokesters with each other. Here they are with Ansel’s wife Virginia, probably at the Atherton home of Rosalie Stern. Adams wrote glowingly about Bender in his autobiography. In the Ansel Adams papers at the Center for Creative Photography and in the Bender papers at Mills College are numerous letters documenting their close friendship. Bender introduced Adams to many people who became important patrons of his work, as well as artists and writers. 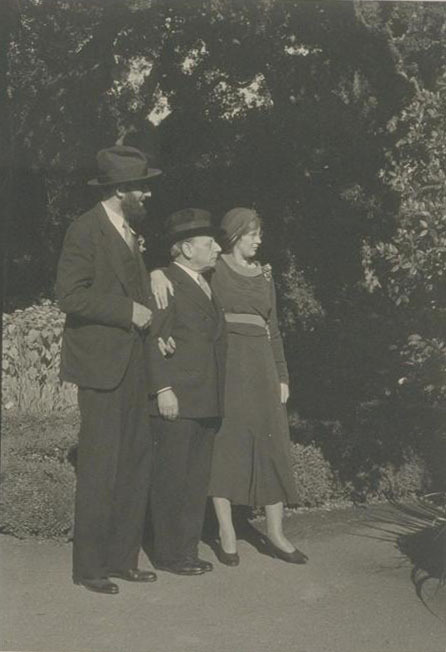 In 1927 they traveled together to Santa Fe and Taos, where Bender introduced Adams to Mary Austin. This led to the creation of a limited edition book, Taos Pueblo, with text by Austin and photographs by Adams. The photographer was eternally grateful to Bender for his early and continuing support, belief in his talent, and friendship. In the Special Collections department of the F. W. Olin Library, Mills College, Oakland, are more than 5,000 items from Albert Bender’s estate. For a description and finding aid, see http://www.mills.edu/academics/library/special_collections/sc_amb_coll.php. It’s from a postcard representing the Golden Gate and the Panama Pacific International Exposition that took place in the Marina District of San Francisco in 1915. Albert Bender helped make insurance arrangements for the fair. Anne Bremer exhibited five paintings and was awarded a Bronze Medal. A portion of the dome and arcade of the Palace of Fine Arts (where Anne’s work was shown) is at the lower left of the image. The Palace of Fine Arts was designed by Bernard Maybeck and still stands today, the only remnant of the exposition, after a series of restorations.